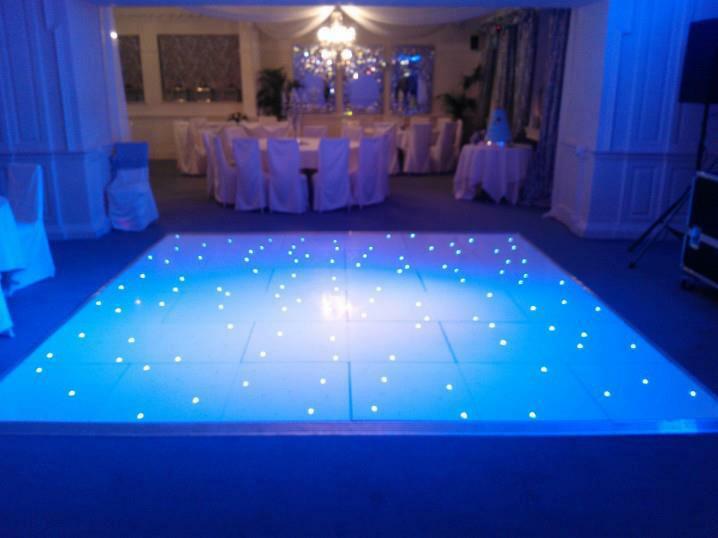 31st May ’14 – Pleased to hire out our 12ft white LED dance floor for Mr & Mrs Rigby’s evening reception at Eaves Hall hotel in West Bradford, Clitheroe. Worth noting that our LED (or starlit) floors are known as ‘wired’ floors. This means that wires underneath the dance floor connect the LED lights, it’s highly unlikely that these will come apart. However, most of our competitors are using cheaper ‘wireless’ contacts. The problem with these is that during the course of the evening, they get knocked around a little as people dance or even walk across them & lose the contact, then some panels won’t light up which looks naff. We also have an offer on at the moment, when hiring our white LED floors, you can also hire a set of 10 uplighters for £25. (Full retail price is £14 each or £140 for 10) These set the room off quite nicely. Price depends on which size you require, at Eaves Hall, the 12 ft floor is big enough, but we can go up to a 20ft white LED dance floor if required.